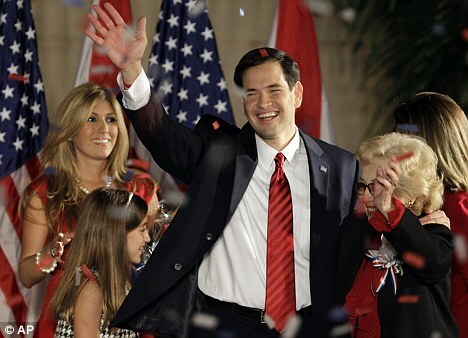 Tags: Marco Rubio, US Senator-elect, 2010 elections, Florida, victory speech To share or post to your site, click on "Post Link". Please mention / link to America's Best Choice. Thanks! Posted by Bill Smith : Post Link --> 8:34 PM 0 Comments - Share Yours! Throughout the now concluded election season, one person’s analysis of precincts, ability to organize BREC and willingness to lend crucial ground war advice to all candidates stood out above the rest. Richard DeNapoli’s knowledge of the numbers and his ability to use them to our advantage was unparalleled throughout the last cycle. Broward Republicans need him as our Chairman going forward into this crucial redistricting term. A prolonged battle to safeguard Broward County’s few Republican seats is already shaping up. This battle should not only be of interest to Republicans, but to all who want to see strengthened cooperation between Broward County and our state government, with jobs and opportunity coming to Broward. Richard DeNapoli has also released a plan to strengthen the local clubs and to enhance BREC activism. I won’t rehash the details, as a copy of his plan was sent out to each committeeperson, but I will say that his ideas are just what the doctor ordered for a stronger local party. Unmatched Competence – DeNapoli Kept the Broward GOP Afloat During an Impossible Election Season - s Treasurer, Richard DeNapoli single-handedly revived Republican coffers in a year in which little money flowed, and whatever did generally went directly to candidates. Richard DeNapoli used his position, his ingenuity and his ability to place the Broward GOP into a solid financial position, while 90% of people were tapped out donating to candidates. The primary roles of Chairman are to a) devise a winnable battle plan, b) to raise enough funds to be able to see it through and c) to motivate others to volunteer for a better tomorrow. Richard has accomplished much in all of the above areas and his election is crucial to the success and expansion of BREC. A True Leader - During the past cycle, DeNapoli made himself available to all who asked for his advice. His grasp of the numbers and analysis of precincts was unequaled by any other Republican advisor. I’ve seen candidates in nearly impossible races pay consultants tens of thousands of dollars. As someone who has advised many myself, and who has been horrified by how outside consultants charge way above the norm to do virtually nothing for first time candidates (and who has refused to do same, for candidate after candidate), I can attest first hand to how rare Richard’s honesty is in today’s political climate. Furthermore, Richard didn’t just support candidates with big and flashy names. He offered some of the best advice available to any good candidate who asked. He also encouraged disheartened primary supporters to rally behind our slate of nominees. That’s someone who cares. And that’s someone who will make a great Chairman. A Team of Leaders - He can’t do it alone. Michael DeGruccio, a leader who spends weekend after weekend and many long nights helping the party, needs to stay on as Secretary. He, like DeNapoli, is also one of the best minds in Broward County. And after outgoing Chairwoman Cindy Guerra and Vice-Chair Ken Haiko’s spectacular performances in only six months on the job, their importance to the movement speaks for itself. They took the job temporarily and they worked it as if it were their lives’ missions. Broward chairmen have a long history of excellence. No senator has worked harder on the job than outgoing Sen. George LeMieux, who cut his teeth in politics as Chairman of the Broward GOP. Richard DeNapoli will need their past insights, as well as all of our support, to be the excellent chairman that he can be, but no one is better positioned to do just that. In the end, Richard DeNapoli became the undisputed Maestro of the ’10 election in Broward County. He represents unparalleled brilliance and dedication and he will organize and reinvigorate Broward Republicans like no other. He needs our help and support. And he deserves nothing less. A Better Florida PAC’s mission is to elect good Republican candidates and to advocate for needed policy. A Better Florida PAC generally abstains from making recommendations on local REC positions, except in cases which are deemed necessary for redistricting efforts. The above is one such case. Tags: BREC, BREC Chairman, Richard DeNapoli, A Better Floria PAC, Broward, GOP, Broward Republicans To share or post to your site, click on "Post Link". Please mention / link to America's Best Choice. Thanks! Posted by Yomin Postelnik : Post Link --> 6:04 AM 0 Comments - Share Yours! Marco Rubio for US Senate - Florida: The former Florida legislature and TEA Party favorite soundly defeated his two opponents. Rubio received 49% of the vote. RINO turned independent but would be democrat Governor Charlie Chris received 30% and Democrat Kendrick Meek received 20% of he vote. Earlier in teh race Christ then a Republican was favored to win and had over $5 million in his war chest compared to Rubio's $340,000. But Rubio had a clear message of smaller limited responsible government and surged ahead of Chris in the race for the Republican nomination. Rather than accept defeat at the polls in the primary, Chris abandoned the GOP to be an independent and would not return money he had raised from Republicans or the Florida Republican Party. After accepting Chris' and Meek's concessions, Rubio cautioned his supporters that it would be a mistake to see his victory as an "embrace of the Republican Party" by voters. Rather, he said, it is a "second chance" for the GOP. Daniel Webster for US Congress - Florida's 8th District: Webster with 56% of the vote soundly defeated incumbent democrat Rep Alan Grayson 38%. Grayson swept into office on the 2008 Obama wave is out after only one term in office. Grayson's became nationally known when he said on the House floor that the GOP health care plan was to "die quickly," Webster conservative common sense message resonated with this predominate Republican district which realized it had made a mistake sending Grayson to Congress. Grayson raised 5 times the money as Webster. Grayson received $5.1 million in contributions from around the country as compared to Webster's $1.3 million. Allen West for US Congress - Florida's 22nd District: Retired ArmyLt Col Allan West is a fiery American who is a TEA Party favorite. He will be one of the few Republican black Americans in the new Congress and will continue to garner attention. West ran in 2008 against Ron Klein in 2008 and lost. Kelin garnered 50.9% of the votes and West new on the scene received 45.3%. However, this time West received 54.4% and Klein 45.6%. Allan West is an outspoken orator and advocated for the US Constitution. Rick Scott for Florida Governor: After a contentious battle Rick Scott (R) will be the next governor of Florida after state Chief Financial Officer Alex Sink (D) conceded. Sink's concession came as raw vote totals showed her trailing Scott by roughly 50,000 votes out of more than five million cast. Scott is a successful businessman an multimillionaire and ran on an anti-establishment message and was supported by the TEA Party. In addition to getting the state on a sound financial footing and reducing the size of government, Scott supports secure borders, no amnesty, gun rights, and other issues of conservative issues. But his expertise as an entrepreneurs in the healthcare industry will help Florida tackle the issues created by ObamaCare and addressing the health needs of Floridians. Scott's running mate also made history. Rep Jennifer Carroll of Jacksonville was the first black female Republican elected to the state legislature and with Sinks victory becomes the state's first black lieutenant governor. Adam Putnam for Florida Commissioner of Agriculture: Putnam who was elected to the US Congressman at age 27, and after five terms in the US House left to return home to pursue his passion in Agriculture as the Commissioner of Agriculture. Putnam with 58% defeated Scott Maddox who received 36% of the vote. Tags: Florida, endorsed candidates, victories, Marco Rubio, Allan West, Daniel Webster, Rick Scott, Jennifer Carroll, Adam Putnam, republican, To share or post to your site, click on "Post Link". Please mention / link to America's Best Choice. Thanks! Posted by Bill Smith : Post Link --> 1:05 PM 0 Comments - Share Yours!